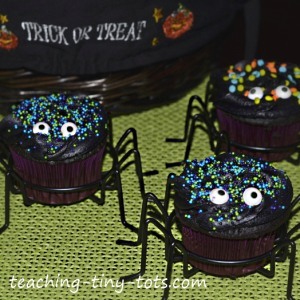 Spider cupcakes make wonderful Halloween party treats and adds a festive look to your party table. Using these cute cupcake holders from Crate and Barrel make this an easy to make cupcake. I have also seen these at Target. Add colored sprinkles and make your own eyes or use these Wilton ones and you are done! Black string licorice if cupcake holders are not available. Frosting of your choice. We like to make our own Buttercream Icing and use the 1M Swirl Tip from Wilton. Cupcake liners in purple, black or orange. Wilton Candy Eyeballs that can be found at WalMart or Craft stores. Bake cupcakes as directed by your box mix or favorite recipe. While it's cooling, make your frosting if you are using home made. Decorate with frosting and add sprinkles and eyes. Let frosting set and then place decorated cupcake in holder. We found skinny black licorice strings at a candy store in the mall or at a few grocery stores like WalMart during Halloween. 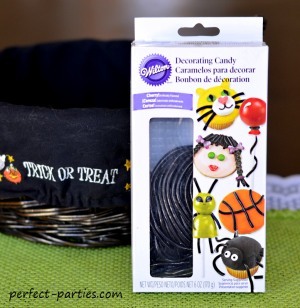 At Walmart we found Wilton Decorating Candy Licorice but it is a seasonal item. It can be difficult to find! Different cupcake pans will have different results. Using the Circulon pan gave the cupcakes a higher profile with a "muffin top" look while my basic pan had flatter cupcakes! 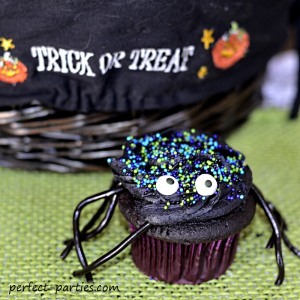 Be sure to cool cupcakes before decorating or your frosting will melt into the cupcake.